One of 4 world class events in Vancouver 2010. More to come! 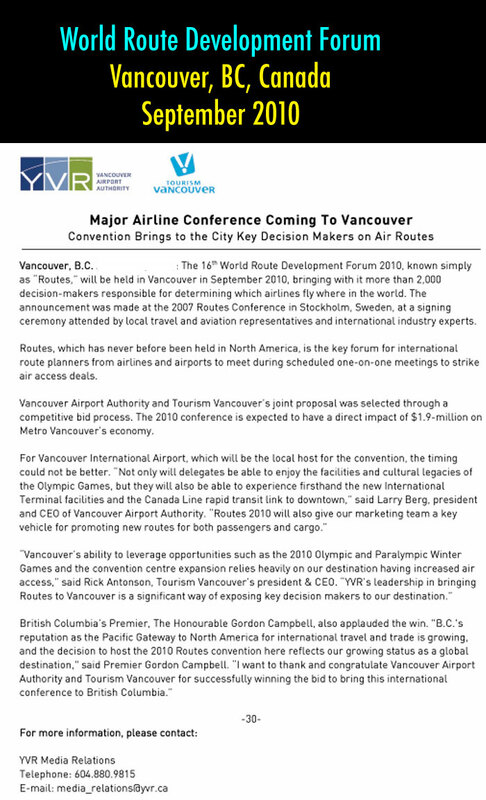 The 16th World Route Development Forum, known simply as "Routes," will be held in Vancouver in September 2010, bringing with it more than 2,000 decision-makers responsible for determining which airlines fly where in the world. This exciting announcement was made at the 2007 Routes Conference in Stockholm, Sweden, in late September at a signing ceremony attended by local travel and aviation representatives and international industry experts. Routes, which has never before been held in North America, is the key forum for international route planners from airlines and airports to meet during scheduled one-on-one meetings to strike air access deals. The Airport Authority and Tourism Vancouver's joint proposal - which was endorsed by BC Premier Gordon Campbell - was selected through a competitive bid process. Both the Airport Authority's Larry Berg and Tourism Vancouver's Rick Antonson were on hand to celebrate the win. Our growing status as a global trade and travel destination and our role as host of the 2010 Winter Olympics make Vancouver a natural fit for the 2010 Routes conference, which is expected to have a direct economic impact of $1.9-million on the local economy. 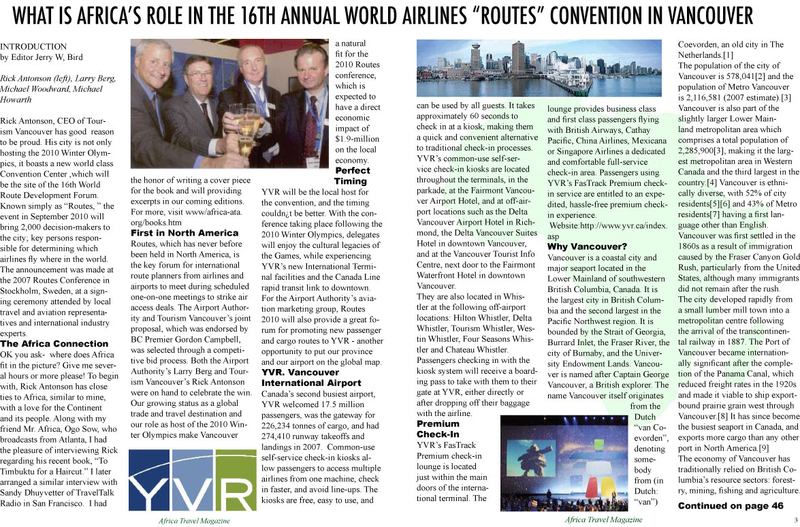 YVR will be the local host for the convention, and the timing couldn¿t be better. With the conference taking place following the 2010 Winter Olympics, delegates will enjoy the cultural legacies of the Games, while experiencing YVR's new International Terminal facilities and the Canada Line rapid transit link to downtown. For the Airport Authority's aviation marketing group, Routes 2010 will also provide a great forum for promoting new passenger and cargo routes to YVR - another opportunity to put our province and our airport on the global map.